There is a PQ near my son’s nursery and we often go there for lunch after I pick him up. We have our own little ritual. As we walk in, the negotiations immediately begin. Rayan wants to eat either a chocolate tart or éclair for lunch. I then attempt to talk him down to something with a bit more nutritional value such as a croissant or blueberry muffin. We then come to a deadlock which is broken by Rayan screaming “Mommmmyyy Peepeeeeee” and then running through the café to the bathroom. Aadam also likes to chime in at this point with a little screech of his own. Puff pastry sheet ** OR make own quiche crust. Recipe below. 1. Roll out puff pastry to line round 9” tin up about 1 ½ inches on sides. 2. Pulse onion in food processor and add on puff pastry. 3. Pulse broccoli, spinach, and garlic in food processor. Add in oregano, generous amount of fresh pepper and salt to taste (about ¼ tsp salt). Mix well. 4. Layer vegetable mixture on top of onion. 5. Layer ½ cup cheese on top of vegetable mixture. 6. In separate bowl mix eggs, milk, cream, and some salt and pepper with electric mixer. Add on top of other items in pan. 7. Top with remaining ¼ cup cheese. 8. Bake in oven at 350F (180C) for 50 minutes. Let sit for 10-15 minutes before cutting. 2. Beat oil and water with whisk or fork to thicken. 3. Pour into flour and mix with fork. 4. Press into 9″ pie crust. 5. Fill with quiche mixture and bake at 400F until done. 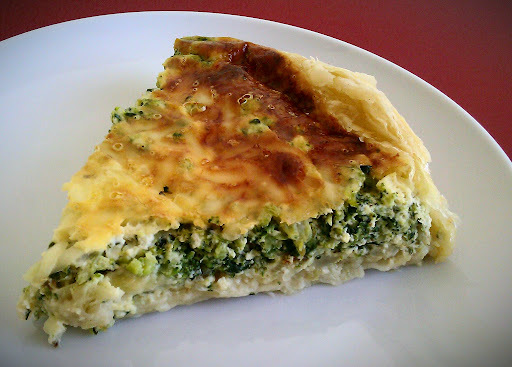 This entry was posted in Breakfast, Lunch, Main Course, Quick Dishes, Vegetarian and tagged easy meals, spinach and broccoli quiche, Vegetarian by thepantrydiva. Bookmark the permalink. Thanks! You know I sometimes leave out the spinach and garlic and it still tastes good! Question: Is it possible to use the canned dough for the Pillsbury Crescent Dinner Rolls as the crust for this recipe? Hello, I've never tried it but it might work! I put a really easy home made crust recipe at the end of this post…it literally takes 5 mins to put together…really easy and fast…and cheaper than Pillsbury! Good luck let me know how it goes!